Andersen’s is pleased present a solo exhibition of new paintings by the Danish artist Freddie A. Lerche entitled MALERI – malerier skal opleves ved konfrontation, ikke gennem andre medier. The show is displayed at both of Andersen’s gallery spaces – Amaliegade and Bredgade, and marks the artist’s second exhibition with the gallery. Freddie A. Lerche is a painter. He paints paintings. His paintings are not figurative, because they do not refer to figures outside of painting. They are not abstract, because they are not abstracted from figuration. They are not pictures, because his works do not depict anything. As he puts it himself, he paints ”picture-less paintings” that liberate painting from the pictorial. This is what he has been doing for more than three decades. The title MALERI – malerier skal opleves ved konfrontation, ikke gennem andre medier translated means, that paintings are meant to be experienced by a direct confrontation with the viewer and not through other medias. The title interacts in a dialogue with our modern society and the use of social media. 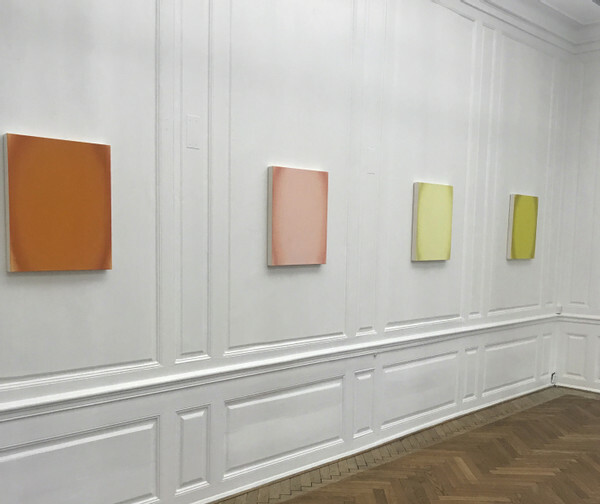 Lerche’s picture-less paintings may initially strike the viewer as monochromes. They are, however, not made by use of one color, but through the application of two or more colors applied with a brush in numerous layers. One after the other, very fine layers, often somewhere between fifty and a hundred - applied to canvas, unprimed canvas. The first layers seep into the canvas. They dry slowly. The following layers dry quicker. The technique used in Lerche’s paintings is best presented through a direct confrontation between the viewer and the canvas, and his paintings cannot be transferred through the use medias. It is difficult to say what Freddie A. Lerche’s paintings are, because they are not intended to depict or refer to anything. Freddie A. Lerche simply wishes them to be, in and of themselves. Beyond the paint on the canvas on the stretcher, his paintings are not. According to Freddie, he does not see why he should, for instance, turn a duck into paint or paint into a duck. Therefore, though his paintings may seem austere, they do not demand any preconditions or prejudices of the viewer. They rather need the viewer to leave his or her preconditions and prejudices behind in order to be present in front of the paintings that are present. Freddie A. Lerche (b. 1937, DK) lives and works in Copenhagen. His works can be found in numerous public collections throughout Denmark, including Statens Museum for Kunst, KUNSTEN in Aalborg, Herning Kunstmuseum, Randers Kunstmuseum, as well as the Esbjerg Kunstmuseum, to name a few. Throughout his career, Lerche has held various positions as guest professor for the Royal Danish Academy, whilst his accomplishments have furthermore been acknowledged through awards and notable recognitions, including most recently the prestigious Thorvaldsen's Medallion in 2011.